Maybe you have not heard the name, (which if you live in Hawaii, I find hard to believe) but you definitely know his work. 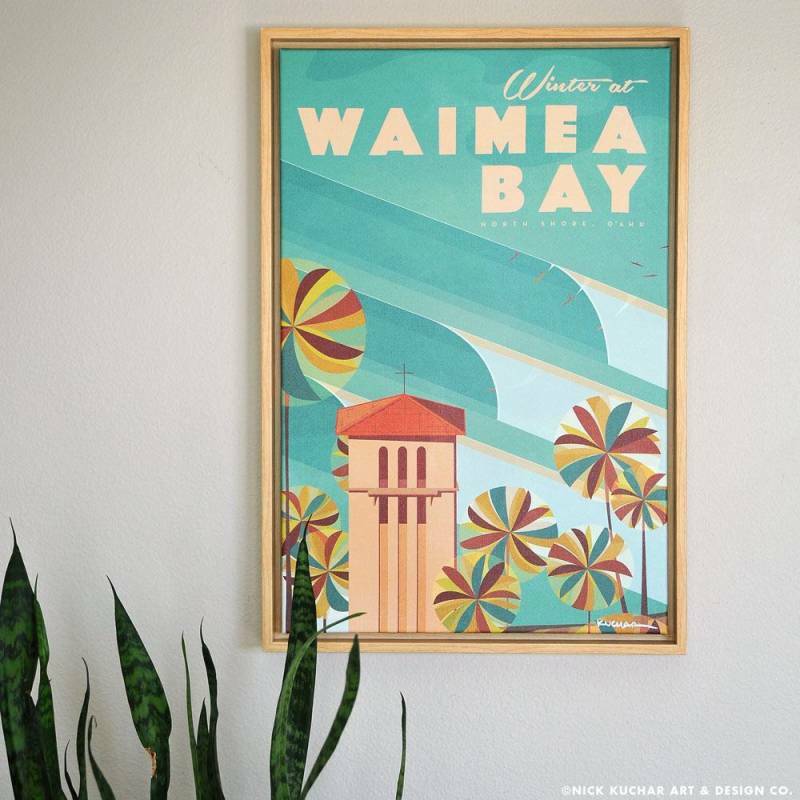 Nick Kuchar is one of Hawaii’s most sought-after artists. 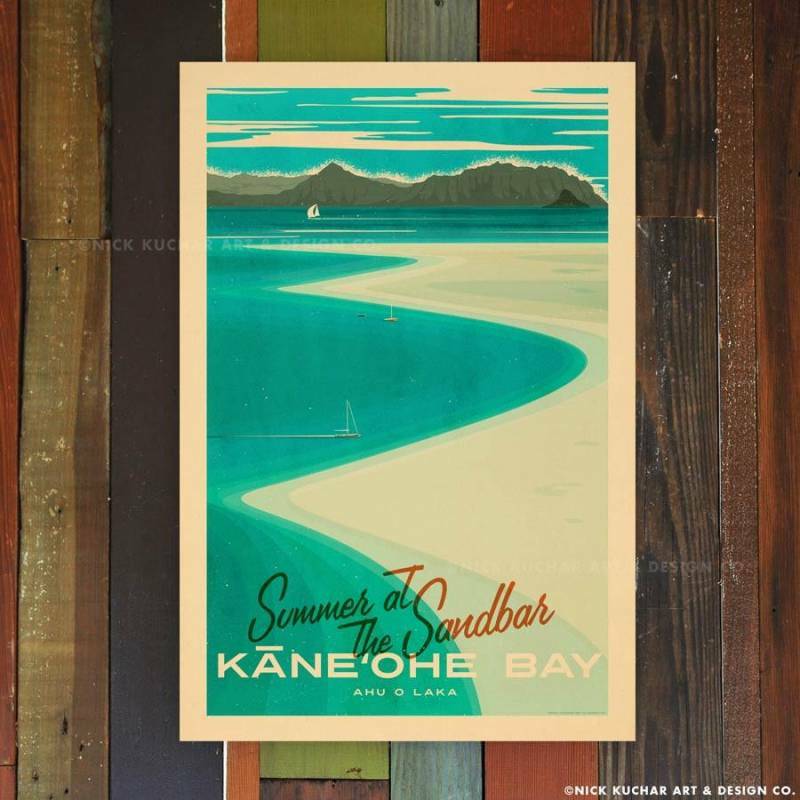 His work is everywhere and can be described as mid-century modern meets tiki industrial chic. He consistently captures the spirit of the islands by animating snapshots of Hawaii as we imagined it was – and hope it will always be. I never really got that part. I mean, why would someone want to be an old poster? (And by that, I do not mean a senior citizen with a Facebook account.) The curious thing is that she wishes not to be in the old rodeo, but to be the poster of the old rodeo. The rodeo was over decades ago, but the poster still lives on. Now it is both past and present, art and artifact. I think now I get it. Maybe, I too want to be a poster, but make mine a Nick Kuchar. I could forever be strumming on a ukulele in Haleiwa with long flowing hair like in a seventies shampoo commercial. I would be timeless in a colorful work of art worthy of both a gallery and a really cool postcard. Nick’s work feels both modern and vintage at the same time. It challenges the sentiments by evoking a feeling of nostalgia while colliding with the present and the future. His work would dually look right at home in a poster under a cinema marquee in the forties as it would in a sleek modern office. I have long been a fan of Nick Kuchar and use his work to stage my listings. (Sometimes, people ask more about the art than the house.) I had the opportunity to speak to Nick about his work and his life in Hawaii, and after our conversation I feel like I am an even bigger fan now than before I met him. Nick moved to Hawaii from Florida with his wife Rachel 13 years ago. A honey turned extended honeymoon. They reside in Ewa Beach, O‘ahu with their twin toddlers and are the real deal. 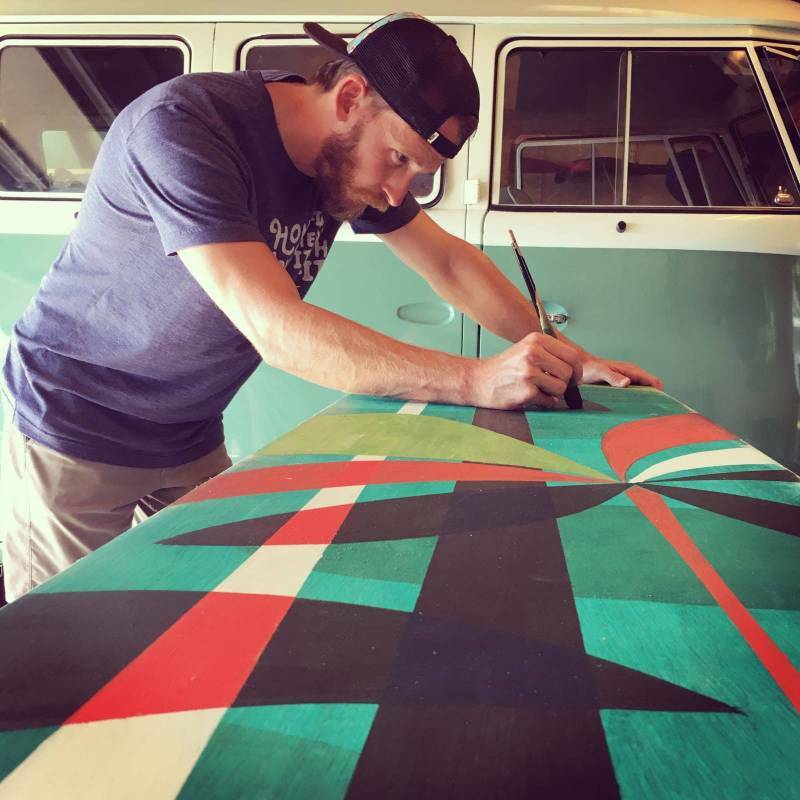 Nick drives a vintage VW bus that he shipped from California and did all the work himself. The van is complete with surf racks and baby seats. Nick and Rachel met at Auburn University where Nick trained as a product designer. He said it was his work as a product designer that keeps him humble. Humble, I dare say, is an understatement. Nick credits all of his success to his wife, who he claims is less risk averse than he is. There is no air of artistic snobbery about him. His manner is down-to-earth, witty, and easy to talk to. He and his wife have been known to take in foster dogs and foster kids. They help serve meals at the IHS homeless shelter and partner with several other humanitarian and ‘aina focused charities in their community. Well, the artist gene might have skipped a generation, but he did get some of his signature style from his father, who Nick claims is a bit of a “pack rat.” Growing up around salvaged Americana pieces Nick has an appreciation for things like old washboards, vintage gas station signs and old tools and farm equipment. Nick said he was fascinated by the vintage signage, which is evident in his work. His process now is to sketch and then transfer the sketch to his computer where he gives it the signature vintage charm. Nick and his wife like to surf, hike, and play acoustic guitar and piano. They can often be found enjoying the sunset or surfing Hau Bush, a popular local surf spot. They love their Hawaii Life and when I asked if he planned to leave the island he said they couldn’t imagine living anywhere else. I can’t say I blame him. You can find Nick’s his work at stores like Roberta Oaks and Red Pineapple. He also shows at the Green Room Gallery or shop online at www.nickkuchar.com. Erin Giaretto is a REALTOR-Associate with Hawai'i Life. You can email me at	ErinGiaretto@HawaiiLife.com	or via phone at (808) 777-9696.